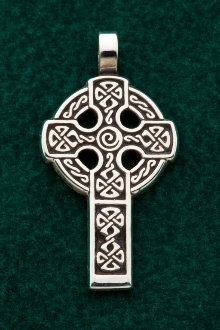 Large Celtic High Cross Pendant. Sterling Silver. This version of the Celtic High Cross is an original adaptation of the famous high crosses of Ireland, Iona, Scotland, Wales and beyond. I tried to capture the essential structure, stature and strength of these epic stone crosses, but in a style and fomat that translates to good readable jewelry design. Often the "wheel" portion of these crosses are carved on a separate stone which is lifted up upon the top of the "staff" of the cross pillar during the construction of the 11 to 12 foot high crosses in stone. Spiral type images are also a fairly common design motif which is in honor of the "doorway to the spiritworld", located in the symbolic intersection of the "heavenly" vertical, and "Earthly" horizontal axis. Not included in this design, by way of information, is the base stone supporting the weight and balance of the stone crosses. There are also many examples of a variation of this type of cross, with a "capstone" on top. In my design, I wanted to capture the essential elements without adding a lot of weight and size to the design as an easy to wear jewelry piece. Not available yet onliine are the many variations of these patterns that I have customized with addition of soldered symbols, stones etc, which can be found at my festivals and events. The exception is the "High Cross with Trinity" which is an example of this kind of customization, available in the cross section of the site. This size is one of the more common items that men are attracted to as a nice strong everyday cross to wear. Women and men alike are also fond of the medium (next smaller) size version of this design, where mainly women only are are purchasing the more filigree version at the smallest size. Thanks for your interest in my original cross designs! Copyright © 1997-2013. All rights reserved.